US stock markets continued their march higher yesterday, and futures suggest they are set to open in the green today as well, buoyed by optimism around trade after the US President indicated the talks in Beijing are going “very well”. High-level negotiations kicked off earlier today and will conclude tomorrow. Indeed, expectations for a deal are elevated following encouraging comments and gestures by both the American and Chinese leaders, something reflected in recent price action. Even though this is justified, it also implies the risks surrounding stocks over the next few sessions may be asymmetric and skewed lower, as anything short of explicit signals of real progress may bring this whole narrative in doubt. Put differently, much hope is likely priced in already, which leaves plenty of room for a correction if things don’t play out precisely as traders anticipate this week. While the most likely scenario remains that a deal will ultimately be struck, lots of twists and turns probably lie between that and now. Another factor to consider, which has likely been keeping a lid on even greater equity market gains, are recent calls by prominent US Senators such as Sanders and Rubio to limit corporate stock buybacks. The fact that lawmakers across the aisle seem to support a similar line of approach on this issue suggests this is a risk worth watching closely. 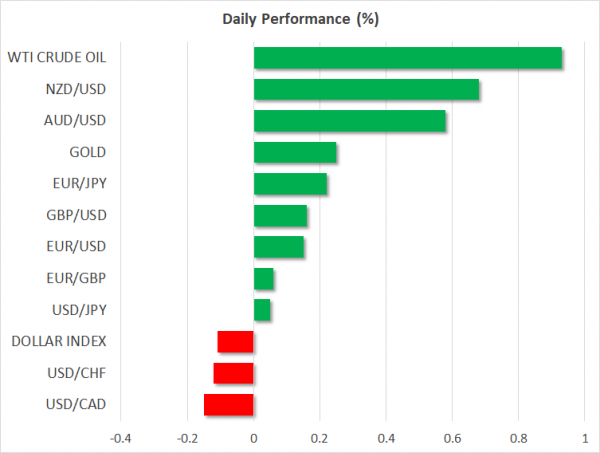 The world’s reserve currency outperformed most of its G10 peers on Wednesday, outside of the kiwi, drawing support from stronger-than-anticipated US inflation data. The core CPI, which excludes volatile food and energy prices, clocked in at 2.2% annually, beating the consensus for a pullback to 2.1%. Since the Fed recently placed a lot of emphasis on wanting to see inflation pick up steam before contemplating further tightening, the news led investors to price in a minor probability for a hike this year, pushing US yields and the dollar higher. The greenback is giving back some of these gains early on Thursday, though much of its intraday direction will likely depend on the US retail sales for December due later today, which were delayed due to the government shutdown. Overall, with European growth concerns and Brexit risks continuing to cast a shadow over the euro and pound, there currently seems to be no viable alternative to the dollar, which still offers the highest yields in the G10 universe. In terms of data, China’s trade figures for January have already been released and beat forecasts notably, propelling both the aussie and the kiwi higher. Now, attention turns to China’s inflation data for the same month, which will be released overnight. Of course, what signals come out of the trade talks will also be crucial, as both Australia and New Zealand are heavily trade-exposed economies. In Europe, Germany’s GDP figures for Q4 fell slightly short of expectations, though Europe’s growth engine still managed to dodge a technical recession. The reaction in the euro was limited. The second estimate of GDP for the entire euro area will also be released. On the Brexit front, Parliament will debate a motion that would allow the government to continue negotiating and seek changes to the Irish backstop. Lawmakers will have the opportunity to vote on some amendments at 17:00 GMT, but these will reportedly be non-binding and thus, will serve merely as suggestions. Hence, any major market reaction seems somewhat unlikely, unless one of these amendments manages to gather exceptional support. In earnings, Coca Cola and Nvidia will be among the biggest names reporting their quarterly results today.